Lee Seung-u’s The Private Life of Plants (translated by Inrae You Vinciguerra and Louis Vinciguerra) is the story of a family with some tough times behind them. It’s told by Ki-hyeon, a thirty-year-old man with a chequered history, who moves back home after several years away. He rejoins his mother, his quiet father and his brother, who lost the use of his legs after an accident during his military service, and if he isn’t exactly welcomed back with open arms, Ki-hyeon manages to settle back into life in the family home with few real difficulties. Having no other work on the horizon, he decides to make a new career for himself as a private investigator, and is rather surprised when one of his first assignments turns out to be a request to trail his own mother. He decides to take it on, and it proves to be the start of a momentous chain of events. By following her, he is to discover more about his family (and its history) and perhaps bring them closer together as a result. The Private Life of Plants is about the ways in which desire can both worsen and mitigate our flaws. We meet amputee sons whose mothers cart them from brothel to brothel; we meet brothers who love their brothers’ lover, and whose lovers in turn are stolen away by the husbands of their sisters. Sexuality in all its ugliness and confusion is put under the microscope by Lee Seung-u, who reminds us that love may come in many forms but that it is, nonetheless, a force that unifies us all… whether we like it or not. Immediately, I was expecting either a sexual work, such as Jang Jung-il’s When Adam Opens His Eyes, or a knockabout family romp like Cheon Myeong-kwan’s Modern Family. While there are certainly elements of those books here, that’s really not what Lee’s novel is about. Instead, it’s an interesting, slow-burning work with a number of sub-plots, well crafted and always intriguing. The main focus of the novel is on family, with the writer stripping clear illusions of a happy, harmonious home life. Ki-hyeon has always had an uneasy relationship with his family, overshadowed by his intelligent, hard-working sibling. As a teenager he’s jealous not only of his mother’s affection but also of Woo-hyeon’s beautiful girlfriend, and when we return to the present day, we can add a sense of guilt to the mix. He feels that his brother’s disability is somehow his fault – and, funnily enough (indirectly, at least), he may well be right. It’s not just the relationship with his brother that’s strained, though, as he struggles to relate to his parents, too. His mother is polite, but distant, which makes her sudden request to have Ki-hyeon deal with Woo-hyeon’s sexual needs even more bizarre. As for the father, he’s an elderly man who has completely withdrawn from the outside world, caring only for watching paduk games on TV and looking after the plants in the garden. As their housekeeper remarks, this is a family in name only. In truth, they’re merely a collection of strangers living under the same roof. Many of these secrets relate to relationships. There are several love triangles here, and they are often fraught and tense. The writer shows the darker side of obsession, particularly unrequited love, eschewing the temptation to paint the relationships he describes in a rosy light. Of course, like many Korean novels, this one is a commentary on wider society, too. Life in Korea can be brutal at times, and Lee wheels out common tropes of military violence, government oppression and the use of power for personal gain. What makes this more affecting than clichéd is the way we follow the consequences of the actions and see how they affect Lee’s characters. Woo-hyeon is the most obvious example here, but Ki-hyeon is to realise that his mother, father and even his brother’s ex-girlfriend, Soon-mee, are caught up in events they have no control over. Every step he takes closer to the truth sees him uncovering more hurt and abuse. 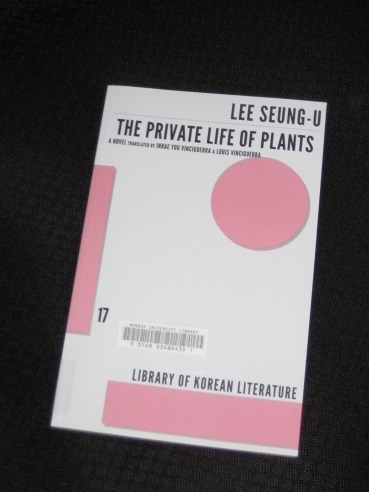 The Private Life of Plants is well-written, and the Vinciguerras (who have had a hand in several of the Library of Korean Literature titles) have done excellent work. One of the most successful features of the book is the voice of Ki-hyeon himself, an ambiguous figure who has his own fair share of failings. We’re forced to rely on his side of the story to keep up with what’s going on, but there’s frequently a nagging suspicion that he’s not telling us the whole truth. Despite the subject matter, Lee and his translators occasionally provide a softer tone. One part of the book in particular, when Ki-hyeon follows his mother at the request of his ’employer’ and tracks her down far from the capital, has a slightly magical air, reminding me of the work of Haruki Murakami or Hiromi Kawakami’s novel Manazuru. The writer never strays too far into the area of magical-realism, but there are several enjoyable oases of calm scattered through the mainly realistic novel, reminders that life does have its softer side.